If you have children and work outside the home, then you know you owe teachers a debt of gratitude. These dedicated professionals choose to spend their time with dozens of kids every day — not just taking care of them, but also preparing them to become informed, thoughtful, and well-behaved members of their communities. Workplace positivity grows through appreciation and, specifically, great compliments. Start practicing today, World Compliment Day, to get ready for Employee Appreciation Day later this week. Held annually on March 1, World Compliment Day has its origins in the Netherlands. In a memorial tribute to Mary Tyler Moore this week, Baltimore Sun TV critic David Zurawik recalls an iconic example of a workplace Thank You on her show in the 1970s. Workplace kindness may be one of the rarest forms of kindness. We’re more frequently expected to share kindness at home, with friends, in places of worship, in our neighborhood and at school. Thanksgiving is less than two weeks away! Now is the perfect time to write a Thanksgiving letter to employees and share your heartfelt appreciation for all they do for you and your business. Staff appreciation gifts that send a meaningful message of thanks don’t need to break your budget! 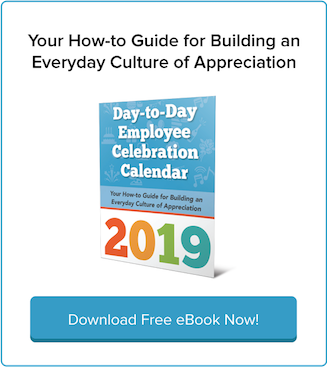 In fact, budget-friendly staff appreciation gifts are more effective than even expensive bonuses because the focus is on your gratitude and on a thoughtful gift that has personal significance. 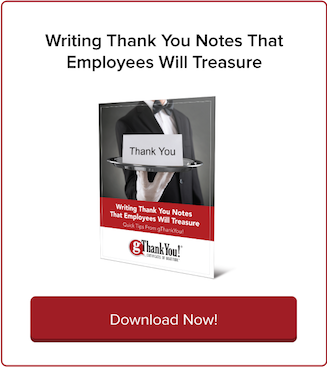 A thoughtful employee Thank You note motivates employees more than the prospect of a cash bonus or promotion, according to a recent study. The study, from Appirio, underscores the importance of a boss’ appreciation to employees. Here’s an employee Thank You idea for later this week: International Picnic Day is coming up this Saturday, June 18! It’s the perfect opportunity to recognize your staff and celebrate the beginning of summer. #ThankATeacher In Your Life This Week! Did you #ThankATeacher yet this week? Today, Tuesday, May 3 is National Teacher Day! It’s also National Teacher Appreciation Week, so you still have time to share your gratitude through Friday, May 6. Was the Bard a good boss? Absolutely, says the late John O. Whitney, management professor at Columbia Business School. In a 2000 NPR interview, Whitney discussed William Shakespeare’s business wisdom. 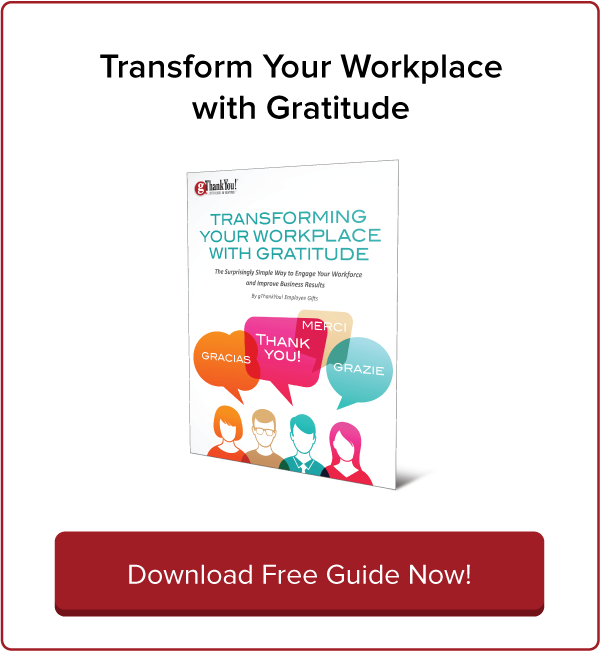 Building a culture of workplace gratitude takes more than a paycheck. Yet many companies still operate under the false assumption that employee compensation is thanks enough. In a recent Harvard Business Review, author Shawn Achor shared an anecdote about a Fortune 100 leader who believes employee happiness is a simple given. 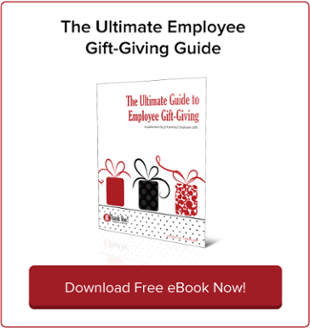 Keep everyone focused and accountable with an annual employee Thank You plan! Investing the time and effort in a year-long employee engagement plan will be a welcome relief in stressful times later in the year. 10 Last Minute Thank You Gifts for Boss’s Day! Hopefully your boss expresses his or her appreciation for your work regularly. Today is your opportunity to return the favor with a small thank you gift or note for providing the tools that make it easier to do your job well.